Are you ready to expand your Tunisian crochet knowledge? Join crochet expert Sharon Silverman as she takes you step-by-step through intermediate Tunisian crochet stitches and techniques while you build your confidence with two gorgeous exclusive projects -- a cozy scarf and a stunning shawl. The Honeycomb Stitch with its two-row repeat that creates side-by-side hexagons. The Full Stitch that creates a Bargello-like effect. The Arrow Stitch that produces a lacy fabric. The Cluster Stitch, which is the only stitch used that creates the design on the return pass. The Crossed Stitch, worked both stacked and staggered, which is a clever but easy stitch that adds extra interest to the design. 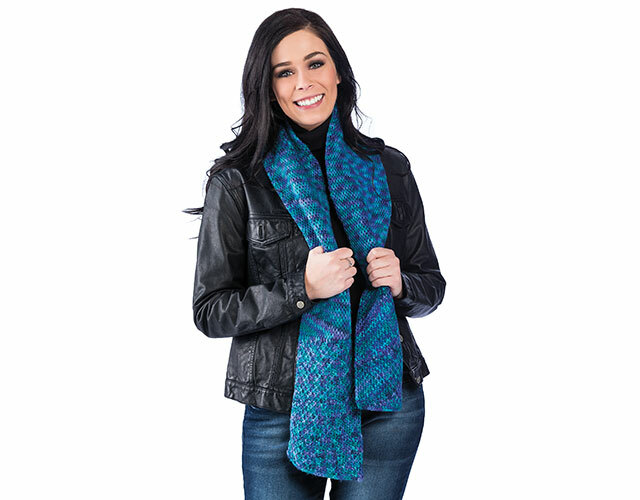 Class includes complete, step-by-step instructions for two exclusive projects including the Two-Texture Tunisian Scarf and the Lacy Tunisian Shawl. I absolutely love this class. It was easy to understand and very straightforward! She explained things in a wonderful and clear manner that made learning something new simple. The video was also well done. I could see and follow along with ease. Definitely recommend this class. The time I spent learning and doing the stitches was well spent. If she decides to do another class, I will definitely be watching and following it! This is such a wonderful class. I love all the different stitches and Sharon is a wonderful teacher. She explains everything so clearly. Camera angles are great, you can see exactly how each stitch is formed. I would highly recommend this class if you want to take your skills a little further on from Kim Guzmanâ€™s also excellent basic Tunisian class. Could we please have some more Tunisian crochet classes, especially on garments. Maybe a simple summer top. That would be great. This is a very understandable, and doable class. The instructions are very clear, and easy to follow. I've been doing Tunisian crochet for over 45 years, and I still managed to learn a lot. The instructor explains everything to make following very easy. I recommend this class wholeheartedly. Marvelous (Advance Tunisian) crochet class which I really enjoyed from start to finish. The patterns and techniques use in this class are just brilliant and Sharon is a wonderful, calm teacher who gets the message across nicely. Thank you for an excellent class, from Miss Ramsey. I learned to do this stitch years ago, my mother has made beautiful afghans with designs crocheted into them. Takes a while to get a project finished, but it is well worth it.